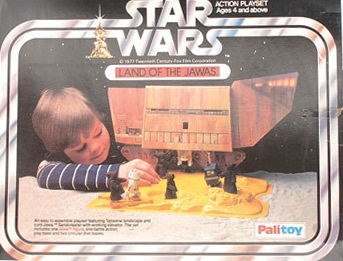 The Land of the Jawas playset was one of the earliest playsets to be created by the engineers at Kenner and was first released in 1979 for a RRP of $12.99. The playset was first advertised on the back of the 20a cardback where a prototype of the playset can be seen. This is the same prototype which can be seen here in this catalogue promoting the new toys coming in 1979. I’m pretty sure that it says Escape Pod Pocket in the catalogue which was corrected to Rocket on the cardbacks. Here is the playset in all of its glory featuring an escape pod, manual lift and R2-D2 cave to play out scenes from A New Hope. 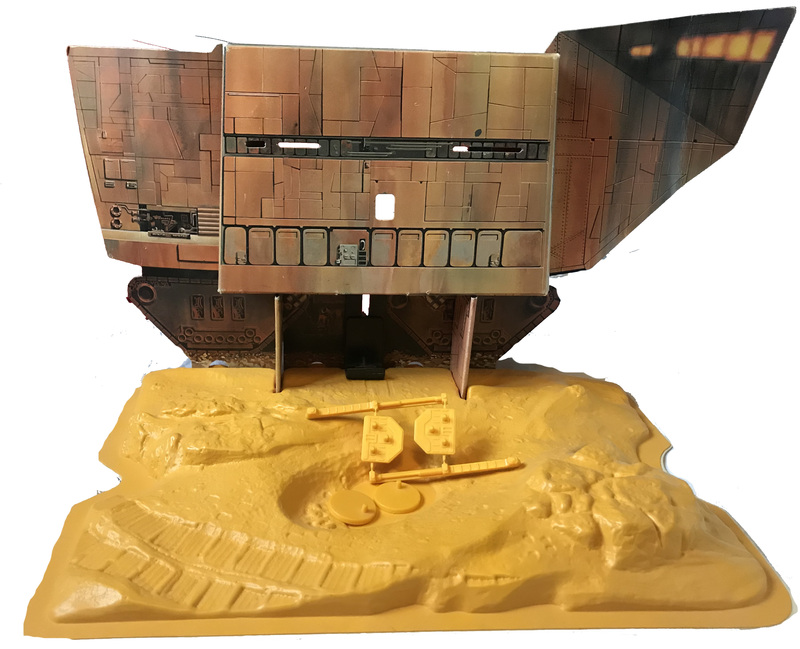 I’m not sure what the purposes of the slits and the rectangular shape hole is on the front of the Sandcrawler. They remind me of crossbow slits found in medieval castles. 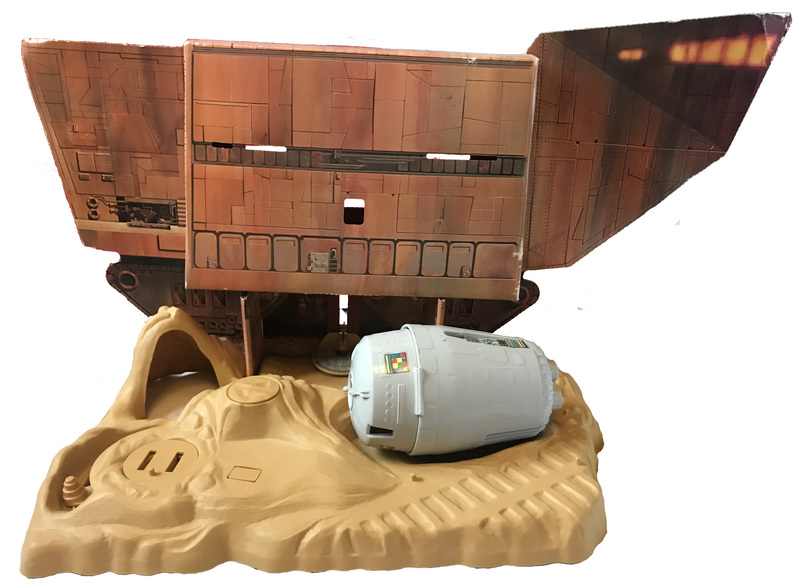 You can see the platform for the lift at the back and a lever at the rear could be used to lift figures into the hole in the base of the Sandcrawler. Coupled with a lever to knock over duelling figures and tyre tracks left in the sand this is one impressive set. Unfortunately, due to the increasing costs of plastics in the UK, Palitoy could not afford to replicate this playset in this manner and needed to reduce material costs. Removing the Escape Pod, cave and action levers were the most obvious changes to make but Palitoy went further and remoulded the base using less study plastic so a cardboard base underneath was used to keep the shape. Having said that however, I know of many collectors who prefer the Palitoy set which came with a few added bonuses. Here is the Palitoy version of the playset. Other than the base and some extra accessories it looks the same but it is not. 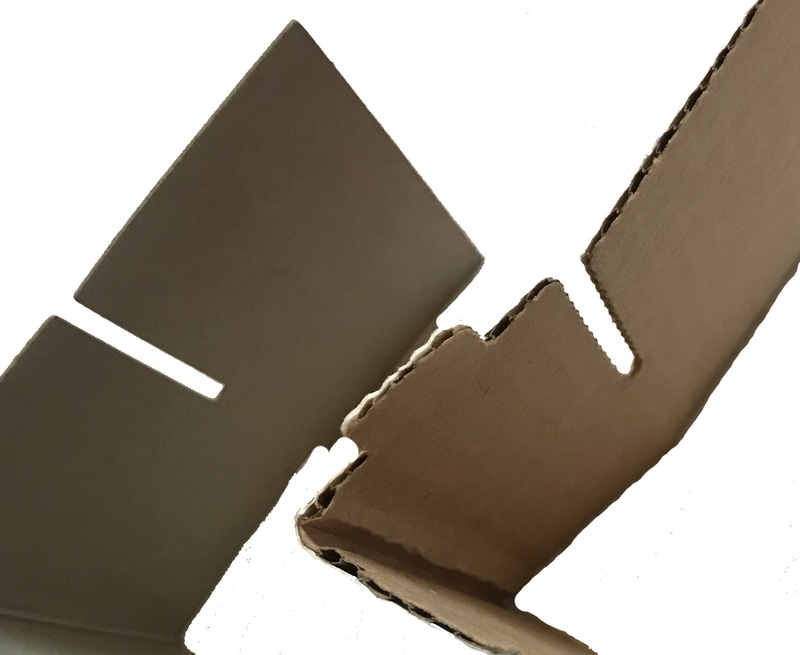 Although the Sandcrawler appears to be the same design it is printed on different cardboard. The Kenner version is much tougher and sturdier using corrugated materials than the Palitoy version. This can be best seen when examining the support struts with the Kenner version on the right. Thanks to Mark Daniels for educating me on this last night! This makes the printing on the Palitoy version also appear lighter in colour than the US version. There are also different cut out shapes on the struts and you can also see the different colours of the lift mechanism in the shots above too. To justify the price point, the Palitoy version includes a fighting stand, two yellow display stands pictured on the set above for figures to pose and a bagged Jawa. 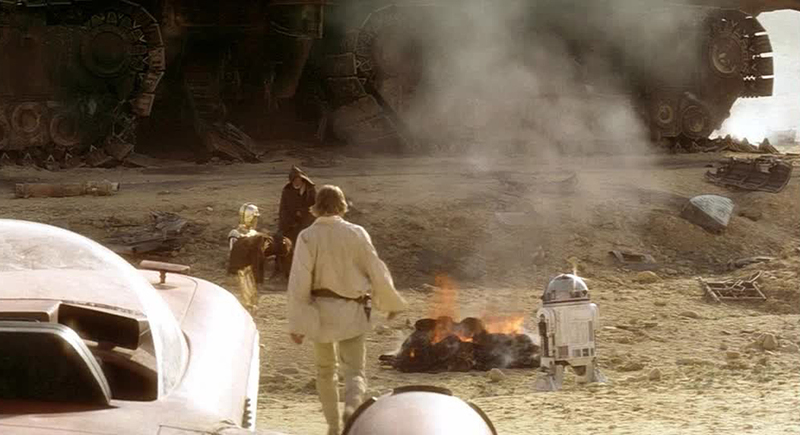 The fighting stand is often missing as the movable pieces would have snapped in rigorous combat between Obi-Wan Kenobi and…. Jawas? The boxed Kenner version was re-released in the same year with a special up to $3 rebate offer. 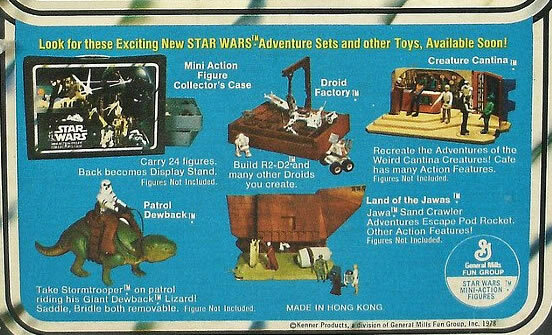 After 1979 no more Land of the Jawas playsets were released in the US although many of them must have been made due to the regularity with which they appear on the market. Due to the changes Palitoy had to recreate their own image for the box. 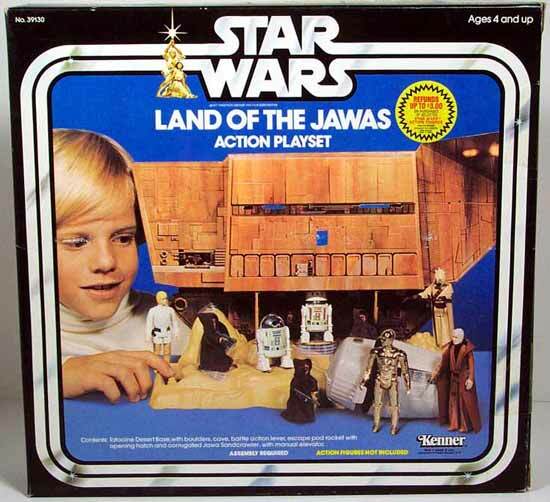 In 1980 Sears Canada released this playset with a carded Jawa as a special offer in 1979 and 1980. Also in Canada, K-Mart released their own promotion, oddly enough, with a carded Yoda. 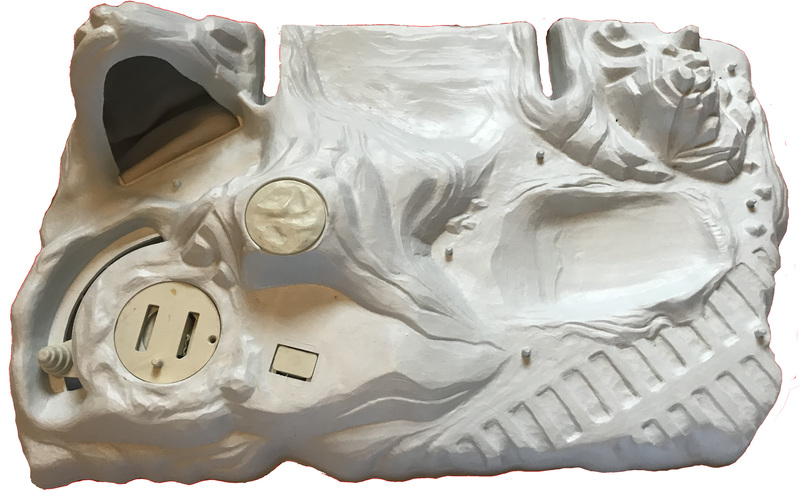 Although the Palitoy base was then consigned to history, Kenner reused the moulds of the Jawas playset base for two further playsets for Hoth scenes in The Empire Strikes Back line. Here is the one from the Hoth Ice Planet Adventure Set. It doesn’t quite work as well does it? The cave is way too small for any kind of Wampa and the tyre tracks were left by…. a mini-rig? 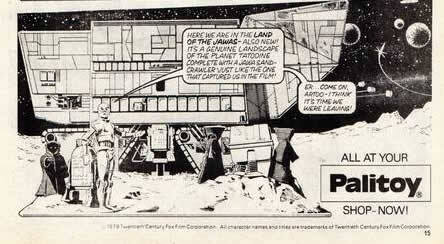 Andy Norton recently scanned in an advert from issue 83 of Star Wars Weekly highlighting the fun adventures to be had on the Land of the Jawas playset. Special thanks to theswca.com, Scott Bradley and Jason Smith for information contained on their websites which greatly assisted this piece. Is the Palitoy Death Star the greatest toy playset ever made?